In the last two weeks, the Library of Congress quietly uploaded more than 3,000 photographs to its new Flickr page. The collection of images range from New York Christmas scenes to early twentieth century baseball. Pictures of Mexico, Texas, Chicago, ships, railroads, and landscapes are included, too. The Library selected the photos, in part, because they have no known copyright restrictions. Flickr members are invited to help add tags. 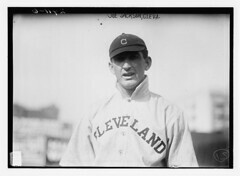 One photo that jumped out at me showed Joe Jackson in his first full major league season. He was fit, trim, and only 22 in 1911, but the future baseball great (and future black-listed White Sox) appeared older than his age would imply. It’s wonderful to see libraries using Flickr to share portions of their picture archives with the public. The National Library of New Zealand was the first one I ran across last year. Several smaller libraries have scanned old community photos into Flickr. I hope many others join in 2008. UPDATE: The ShiftedLibrarian mentioned PhotosNormandie in her blog today. That archive is also being uploaded to Flickr. This entry was posted on Thursday, January 17th, 2008 at 8:44 am and is filed under library issues, social web. You can follow any responses to this entry through the RSS 2.0 feed. You can leave a response, or trackback from your own site. For anyone else considering trying something on Flickr… I really do recommend it. We are getting good access numbers. There are risks and issues, but you may find them to be manageable. When we started piloting this at the National Library of NZ it was actually quite easy to get support given we could lock the copyright down. Now… I’d love to be able to push everything out under CC licenses… but that would have been 100 times harder at the time. And now it turns out that a new way may be opening up for us all. Thanks for mentionning our project “PhotosNormandie”, alive since about one year. A main difference between our project and the LoC pilot project is the following: we are using IPTC metadata that are embedded in our hi-res photos, but LoC does not use IPTC and their descriptions and tags are attached to Flickr platform. Great site Steve – very helpful. I’ve just written a post on my site http://jennylu.wordpress.com/ linking to your page. Hopefully you might get some visits. I’m very new to the blogging world so it may be a trickle, not a flood! That’s a really neat idea – put public domain pictures up somewhere that people will be looking to find images with. Are there any more batches slated for uploading in the near future? Patrick… Very wise of you to use IPTC metadata! Jenny… Hope you enjoy blogging. Alex… The photos on the L of C page is a pilot. They’re enjoying the attention this week, will evaluate the project, and may add more. As they wrote in their blog, there’s more than a million more photo where these 3000 came from. That’s great news. Wow. A potential million-image photostream – I wonder if Flickr’s software is built to be able to handle that kind of volume. From the sounds of the blog response, tagging the millions of photos won’t be a problem at all for the Flickr crowd, so we’re hoping that many more images make their way to the L of C photostream. Flickr is absolutely able to handle a million images. Flickr users upload a few million photos EVERY DAY. And the same comments and tags that keep Flickr’s huge collection organized, searchable, and vibrant will surely enhance the L of C’s archive, too.